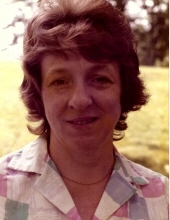 Verna McDaniel, 74, of Manchester, KY, passed away Monday, March 25th, at her home. Verna was born in Ogle, KY on April 22, 1944, a daughter of the late Nettie (Broughton) and Cloyd Swafford. She was a member of the Horse Creek Baptist Church. Verna is survived by her husband, Billy McDaniel, and her two daughters: Linda Wagers and husband Brian of London, and Lisa McDaniel of Manchester. Verna is also survived by three grandchildren: Billy Lee Wagers, Brianna Michelle Wagers, and Brian Nathan Wagers; and by the following brothers and sisters: Arlie Swafford, Arvil Swafford, Edna Downey, Mildred Edwards and Ella Mae McDaniel, all of Manchester. Aside from her parents, Cloyd Swafford and Nettie Broughton Swafford, Verna was preceded in death by the following brothers and sisters: Oscar Swafford, Dennis Swafford, Virgie Smith, and Wilma Swafford. Services will be held at 11:00 AM on Thursday, March 28th at Britton Funeral Home in Manchester, KY, with Kenny Smith officiating. Burial will follow at the Cloyd Swafford Cemetery on Otter Creek. Visitation will be held 6:00 PM on Wednesday, March 27th at Britton Funeral Home in Manchester, KY.
To send flowers or a remembrance gift to the family of Verna McDaniel, please visit our Tribute Store. "Email Address" would like to share the life celebration of Verna McDaniel. Click on the "link" to go to share a favorite memory or leave a condolence message for the family.